I recently wrote a guest blog over on Gemba Panta Rei where I set up a hypothetical takt time question. Jon Miller has been nice enough to offer up some sweet prizes for those who leave meaningful comments before May 1, 2008. So, if you haven’t checked it out please head on over to Gemba Panta Rei and share your thoughts on the matter. For the record, there are lots of unknowns in the scenario so feel free to make assumptions and state those assumptions before leaving your comment so we can all learn and explore this topic together. Go to Gemba Panta Rei by clicking here. I would use a Takt time of 120 sec. this uses about 86% of capacity for the average week. Excess time would be used for demand spikes, unforseen circumstances, lean training, kaisen events etc. I think a takt time of 2 min. would be prudent, this uses about 86% of the availavle capacity keaving 14% for demand spikes, training, kaisen events and unforseen events. Takt time should be 2 min. using about 86% of the available capacity. This would allow about 14% capacity allowing for spikes in demand, kaisen, training and unforseen blips. 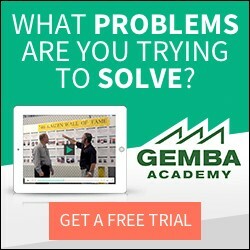 I see that Gemba is finally going to award the prizes for your guest post. Now we need another contest…. Yeah, Jon is one nice guy giving prizes to all! I wonder if the author of the post gets the prize too? Hmmm… Jon? Seriously, it was neat to see all the comments. If you have any ideas for another contest let me know!